A Guide to the Guides of Thoth. 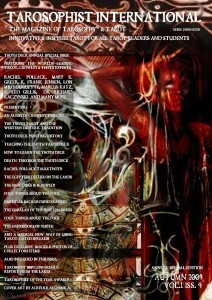 The Tarosophist International magazine from which this article is extracted (with additional content) is 148pp of the world’s leading Tarot and Crowley authors and includes Rachel Pollack, Mary K. Greer, K. Frank Jensen, Lon Milo Duquette, Marcus Katz, R. Leo Gillis, Dr. Richard Kaczynski and MANY more! AN ALEISTER CROWLEY TIMELINE – THE THOTH TAROT AND THE WESTERN ESOTERIC TRADITION – THOTH DECK PRINTING HISTORY – TEACHING THE THOTH TAROT DECK – HOW TO LEARN THE THOTH DECK – DEATH THROUGH THE THOTH DECK – RACHEL POLLACK TALKS THOTH – THE EGYPTIAN DEITIES ON THE CARDS – THE 10 of Disks is Screwed! – FOUR THINGS ABOUT THE FOOL – ESSENTIAL BACKGROUND READING – THE QABALAH OF THE NINE CHAMBERS – THE HANDBOOKS OF THOTH – AND A MAGICAL NEW WAY OF USING TAROT: GATED SPREADS! And is just ONE of over 21 magazines included in your membership, PLUS four more every year – essential reading! Since Crowley produced the Book of Thoth, there have been several attempts to provide further clarifications, commentaries or more introductory-level guides to the deck. As a ubiquitous deck in Germany, it is no surprise that the first attempt was German (Ziegler, 1984) and two other major attempts are also German (Banzhaf & Theler, 1998; Akron, 2007). These have been joined by two streams of alternate approach from both the psychological/anthropological perspective (Arrien, 1987) and the Western Esoteric viewpoint (Wanless, 1987; Willis, 1998; DuQuette, 2003). These seven books, supported by minor works and internet articles, provide many alternate approaches on the complex synthesis of the deck and Crowley’s original dis-jointed text. I here provide a personal review of these books – in my opinion only – against Crowley’s original Book of Thoth. You should be warned in advance that some of these I find a travesty against Crowley’s original intent – as much as that can be surmised. However, having said that, others without my particular approach on Crowley will of course find these works useful and relevant. So long as they encourage you to re-engage with Crowley’s work, and not assume that what you are reading is in any way connected with the cards in front of you, you’ll be fine. To cut to the chase, buy Lon Milo DuQuette’s book and Crowley’s original Book of Thoth first, maybe with Ziegler’s book as a useful companion along the way. 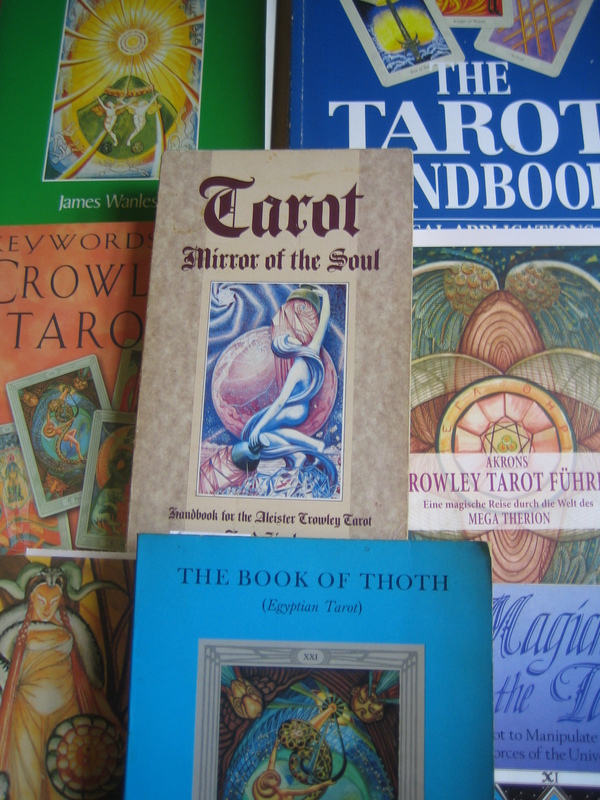 The following summary is a list of the most commonly-known published handbooks on the Thoth deck . For this article, I have not included prior publications of Tarot material by Crowley, such as in the Equinox. Note that the Akron book is in German only. The Banzhaf & Theler book was translated into English in 2001. It is interesting to compare the timeline of these publications with the publication history of the deck itself with most of these handbooks immediately following the publication of the popular Swiss edition of the deck in 1986. You should first have a copy of Crowley’s own Book of Thoth text, even if it is dense, complex, disjointed, often confounding and occasionally contradictory. It is a lifetime reading opportunity of a lifetime work. This first publication of a handbook providing a “detailed examination of the Crowley Thoth deck” is by Gerd Ziegler, who is described as a “therapist specialising in humanistic and spiritual therapy”. The book is a straight-forward, no-nonsense summary of the cards, with little added or over-elaborated. As such, it is a useful handbook for reading the cards when first practising with the deck. There are the usual misconceptions; the very first line of the book in which the Tarot is described as “an ancient system of knowledge which has been taught over the centuries in secret Mystery schools”. However, each card is also given an “indication” (interpretation), a “question”, a “suggestion” and an “affirmation”, which although extremely brief, provide a useful synopsis of the card. Key-words are also provided, and the use of Crowley’s images and interpretations is not ignored, although it is simplified. A promising section at the back of the book, cataloguing and explaining “commonly occurring symbols” throughout the deck is equally brief, and could have been so much better, considering the author states that there are “1200 symbols contained in the 78 cards”. Only 37 of these are listed, on just 2 pages with mainly a one-line description. A small section is also provided on finding one’s Personality Card, Soul Card, and Yearly Growth card by numerological analysis of your birthdate. This idea is expanded in Arrien’s book (following review) without credit – she does not even include Ziegler’s book in the bibliography, although Arrien does ascribe the “Growth Cycles” to Twainhart Hill. It could have been the essential encyclopaedia, but it is still a very useful LWB. An anthropologist who was dismayed to find no Tarot work “addressed the mythological, psychological, or cross-cultural themes prevalent in the Tarot”, Arrien sees the Tarot as “a symbolic map of consciousness and an ancient book of wisdom”. Although she was attracted to the artistic execution and cross-cultural symbolism of the Thoth deck, she “read Crowley’s book that went with this deck and decided that its esotericism in meaning hindered, rather than enhanced, the use of the visual portraitures that Lady Frieda Harris had executed”. So on the positive side, she utilises the images of the Thoth deck and the key-words extensively, but on the negative, she jettisons Crowley’s text because “it is Crowley’s interpretation of these symbols, regardless of his reputation, which with I have an issue”. To me this seems strange, as it is Crowley’s design that informs the cards – and therefore the symbols are not merely “interpreted” by Crowley, but placed there by his design. It seems we should equally honour this intent as well as Harris’s collaboration and execution. Arrien’s book uses Douglas’s (1972) work for its history of Tarot, before moving on to a brief summary of Tarot as an “outer mirror for internal and external processes”. She concludes by suggesting our work with a deck such as the Thoth deck leads us to “be able to see how universal principles, symbols and myths are outer representations of a deep collective psycho-mythology that is working inherently throughout the human species”. From an therapeutic-linguistic point of view, there are several problems with that script, and I personally wouldn’t want any of my clients taking on such incomplete and flawed statements about themselves. But others may find these affirmations helpful and positive as they are surely intended. For each of the Majors, Arrien then provides a message for those whose “Life-Time Personality Symbol” is expressed by that particular card. This life-time symbol is something Arrien has produced based on basic numerology of a persons birthdate. Again, I hesitate to recommend anything reducing a person to a single card, particularly for their entire lifetime. But others may find this insightful and useful. It is in the text of Arrien’s analysis of the Majors we see how far away from Crowley’s intent this book actually goes. In the Empress card, over three pages, little of Crowley’s intended meaning of the symbolism is suggested, instead replaced with Arrien’s rather generic and “new-agey” self-help speak. Thus, the “bumble bee” represents a “way of seeing”, not as the symbol nor meaning Crowley intended it, and even the birds, which are described by Crowley as clearly a Dove and a Sparrow, are seen as “a dove or Kiwi bird,” and “a small sparrow or bluebird”. Crowley is specific with the birds and their significance, Arrien entirely disregards this and cognate meanings. This is evident throughout the card, with an even worse misreading of what is clearly pictured and described by Crowley as the “pelican feeding its young with the blood from its own heart” as a “swan with her four baby swans” by Arrien. Another example will suffice. In this issue of T.I. we have read about the complex mythological and cross-cultural basis of the FORTUNE card. In Arriens, having to completely ignore everything Crowley wrote and intended, and simplify everything Harris painted to its most generic, Arriens is reduced to a single paragraph for the whole card, suggesting simply that for good fortune we should be as “objective as the Sphinx, flexible like the monkey, and reach for new opportunities and ways to express our creative power like the crocodile.” I don’t know how that works, but I can’t think of the crocodile (which is here explicitly given and painted as Typhon, the destroyer, at the descending arc of the wheel) as “creative power”. So, you may be reading about a card with Arrien, but it is not the Thoth card in front of you, that’s for sure! It is a clear case of throwing the baby out with the bath-water. But again, some may find the user-friendly, generic, self-help advice some comfort in contrast with Crowley’s more robust assessment of human motivation and potential. My main annoyance with this book is that it states its intent and interest as being based on cross-cultural and multi-disciplinary work, and to avoid the interpretation of one person, i.e. Crowley, and then throws out all of Crowley’s plainly cross-cultural and multi-disciplinary work in favour of an interpretation unique to Arrien. Even the most simple and straightforward symbolism and mythology is warped – in discussing the Aeon (and having to consult Websters Dictionary for the meaning, in avoiding Crowley’s actual explanation) Osiris is represented as “God of Wisdom” and Isis as “Goddess of Intuition”. These are neither self-evident nor accurate nor useful nor relevant to the cards usage of the images of Osiris – and Isis is not on the card at all. Then we have “Osiris with his forefinger to his mouth” which is actually Harpokrates or the child Horus and I have to give in with the book. There are other sections of the book you may find provocative and useful – a section on using the “thirteen challenge cards” as portals of growth is a useful approach, marred only by the apparently authoritative statement that the “In the entire Book of Thoth, or Book of Wisdom, we find only thirteen challenges or tests pictured”. Which then coincidentally matches with the “thirteen states” of the “Bardo” of the Egyptians. All of which is nonsense, but the following text on using cards such as “Sorrow” (3 of Swords) to rework the state itself is very useful for self-development work. Similarly with the Tarot Constellations which I would have almost certainly purchased as a stand-alone book if given further development and not marred by a mis-reading of the Thoth deck itself. But then I read in the Spreads section that the “Celtic Cross” is the “only spread to have survived since the middle ages” [See Origins of the so-called Ancient Celtic Cross Spread” in T.I. #2] and I have to throw the book across the room again. James Wanless, Ph.D., who designed the Voyager Tarot deck with the often unacknowledged Ken Knutson, presents this next Thoth handbook, which “enables the reader to use the tarot, and the Thoth Deck in particular, with a greater ease and fluidity than ever before”! He acknowledges Arrien as his “original teacher” so it should be no surprise that in many respects this book follows her lead, for example stating that “tarot has endured for thousands of years, since its origins in ancient Egypt” and then explaining that “tarot is an ancient Egyptian word for ‘royal road’”. In extending this error, yet another stretch is made to state not only that this in some way equates with “Torah”, but also that “the destiny of the road of tarot is totality, suggested by another anagram of Tarot, ‘tota’”! This is simply poor – in no sense is “tota” an anagram of Tarot, any more than I could say the Latin name “Marcus” suggests “summa” meaning “summary” because it has some of the letters the same – and tota is actually better toto or totus. The bulk of the book is taken with a page-by-page presentation of keywords for the symbols on the cards, repeating such errors as on the Empress, “Mother Swan and Young = nurturing” and providing such generalisations as on the same card, “Birds = Thoughts”, hence entirely misrepresenting Crowley and Harris’s painstaking five-year design and execution of the deck. The Minor and Court cards are then given comparatively short shrift, with the only interesting component being the addition of key titles for the Court Cards, such as The Knight of Swords being “The Decider” and the Knight of Cups being the “High Flyer”. At least these provocative titles get one agreeing or disagreeing with the nature of the card and character represented by the card. Spreads are also provided against each Major card, such as the “Horns of the Devil” Reading, but these are somewhat bizarre and strangely illustrated. It appears that Wanless owned the publishing company which produced his book. Perhaps he also sketched the illustrations? Designed specifically for use with Anthony Clark’s deck, The Magickal Tarot, itself a variation of the Thoth deck and hence included in this review, Willis’s book promises that it “lays bare actual methods of manipulating the unseen forces of the Universe, information not normally found in print”. Willis dedicates his book to Marian Green. Here, by 1988, at least we see a small transition to historical accuracy, although it is downplayed severely. Willis writes that “nobody knows for sure” where Tarot came from, then goes on for several pages discussing the Egyptian heritage of the deck, where “few commentators actually believe that the Tarot existed in those days in book form” – why that would surely be ridiculous and require proof (!) – so “It was more likely a set of religious pictures such as the vignettes of the Egyptian Book of the Dead …” etc. This gives the impression that such might seriously be the case when in fact there is no evidence at all. The rest of the book provides a few methods for “manipulating the unseen forces”, such as candle magic, meditation and so forth, but all can be easily found in print elsewhere, and more. The analysis of the cards is peppered with interesting snippets and complete fabrication, with no indication of sources or evidence. An example suffices; “Long ago diviners had first to learn the 22 magickal precepts [the 22 Major Arcana] just like any other trainee magician. For in those days, divination was treated as just another facet of magick. After being schooled … the prospective diviner would be taken into one or other of the two Temples of Prophecy”. I have no idea to this day, having studied the history of divination and oracles for twenty years, in Rome, Greece, ancient Egypt, what Willis is talking about here, but I suspect it is entire fiction based on channelled information or hearsay. This self-described “cookbook” follows our previous titles by a good ten years, and improves massively in all respects. Although more of a dictionary than a textbook, it makes a good attempt at the known history of the cards, and references Crowley’s original designs accurately, for example, the Pelican on the Empress card and the Typhon on the Wheel symbolising “annihilating and destructive forces, decay” rather than the new-age interpretations of previous handbooks. The tables against each card give meanings and interpretations for the card in terms of “profession” (i.e. in a career reading), partnership, and positive and negative readings. Rather than an affirmation, the tables give a meaning for the card if chosen as a “Card of the Day”, which in part reflects the late Banzhaf’s astrological background; “Today you may get into a conflict of interests …” reads the 2 of Pentacles, in language familiar to those who consult the newspaper horoscope sections. About 14 spreads are given which are all very interesting. They almost slip when saying that the “Celtic Cross” has “been passed down from earlier ages” but they don’t slip into “from ancient times”! I personally like and recommend this book as a useful companion and given a choice, would probably buy this rather than the earlier Ziegler book, as representing a purer distillation of Crowley and Harris’s original work. If my only trouble with a book on the Thoth deck is to quibble slightly over the alchemical attributions of two of the cards and that book contained just about every other explanation of the Kabbalistic and Alchemical, even some of the sexual, symbolism both obvious and buried in the Thoth deck – then I’d be very pleased. In fact, delighted and somewhat envious I hadn’t written it myself! So it is with highest recommendation (and an eye on the fact that Lon has submitted an article to this magazine and will be sent a copy) that I review this title as follows – go buy it. The Thoth Companion: The Key to the True Symbolic Meaning of the Thoth Tarot. “The heads of the Adept’s wands reflect the conflict between Mars and Venus (Netzach). The Lotus Wands are still blue because of their affinity with Venus, but the Phoenix Wands have tarnished to amber – the colour of Netzach in Atziluth – and the Caduceus Wands are the red of Mars”. This is all interesting if you already know the relevance of Netzach in Atziluth (to anything in the actual world) and the various correspondences and colour scales. This is a good book for highlighting much of the colour symbolism in the deck and is a useful reference guide overall. It is indeed a “companion” text to more advanced students who still require a reference guide. Interesting companion book for advanced students if they need it.